Come October, a handful of Halloween haunted houses open in the Minneapolis, St Paul area. Note that many of these are for adults only, and children should only be allowed in with a parent or guardian over the age of 18. These events include zombie paintball, scary hayrides, terror mazes, and more. Sauk Rapids is an hour northwest of Minneapolis, but it's worth the trek to visit Molitor's Haunted Acres. This sprawling, remote farm has zombie paintball and a haunted hayride through the woods, where ghouls, ghosts, killers, and madmen creep in the shadows. Molitor's Haunted Acres is open on weekends and selected other nights, from September 28 until October 31. Two haunted barns, a haunted hayride, a cage maze, and a beer tent are some of the highlights at the Nightmare Hallow-Scream Park in Columbus, about 30 minutes north of Minneapolis via I-35. 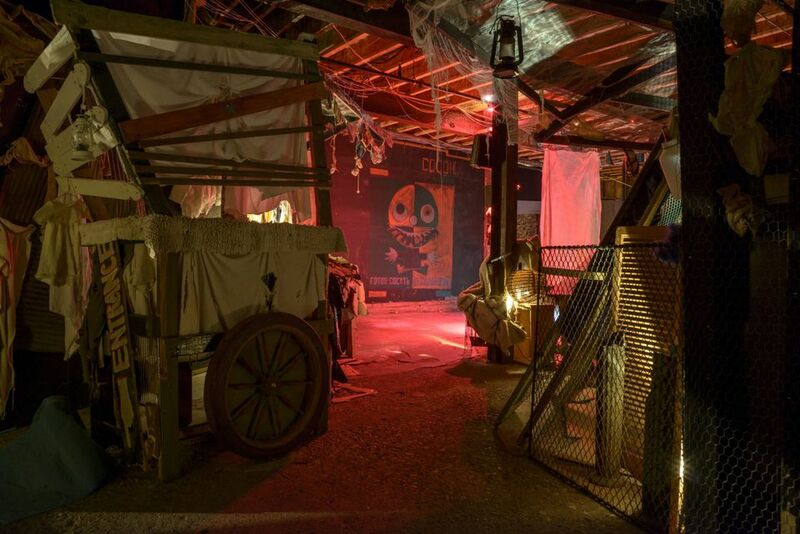 The main event is Terror Trail Camping, an interactive sleepover in the woods, where skeletons, zombies, and other creepy creatures will keep you up all night. It is open weekends and select week dates from October 4 until November 2. Before the snow starts falling, ski hill Buck Hill converts into a large scare zone with four haunted houses. Frightmares is open select dates from October 11 until October 27. One of the area's largest and scariest: Scream Town has the Twin Cities largest haunted corn maze, a haunted forest, as well as three haunted houses. The eight main attractions include the Zombie Apocalypse, Crop Spawn, Santa’s Slay, Oak Blood Forest, Ludicrous Labyrinth, and Circus Asylum. Scream Town is open weekend and select dates from October 4 to November 2. At the ValleyFair amusement park, you'll find a combination of thrill rides and haunted houses for twice the screaming! The entrance price seems expensive but you get access to all the thrill rides as well as haunted houses, a pumpkin festival, survival mazes, and scare zones. ValleyScare is for people ages 13 and older. It is open Fridays and Saturdays, from September 22 to October 28. Trail of Terror is made from the same producers who designed the Minnesota Renaissance Festival, so you can be assured of good costumes. This is another large event, with a huge corn maze, haunted houses, wicked woods walks, scary rides, and other attractions and events like their own zombie pub crawl. Trail of Terror is open Thursdays through Sundays from October 12 to October 28. After the sun sets, visitors can be scared witless in the huge 3D house of horror and on a mile-long hayride of terror. There's also a corn maze and scary movies. Haunting Experience has been operating for more than 30 years; it is open Wednesday through Sunday, plus the whole of Halloween week, from September 27 to November 2. The Ramsey County Sheriff's Department opened Fright Farm in 1996 and has continued to run the scary event ever since. It is held in a century-old barn in Maplewood, and all proceeds go to D.A.R.E. Fright Farm is open Friday and Saturdays beginning October 5 through October 31. The Hamel Lions Haunted Acres is a fundraising event established in 1997. It has raised around $12,000 a year and 2,300 pounds of food for Interfaith Outreach thanks to the help of the Corcoran Lions and the Corcoran Jaycees. This haunted house is located 30 minutes northwest of Minneapolis.